Spring is arguably the riskiest growing period for a grower. Our vineyard is in a cool spot so we tend to have bud break a few weeks later than other vineyards in South County or on hilltop locations. We are out about 6 inches in our white vines and 1-2 inches in the reds. The beginning of the growing season comes in 2 stages. The first sign of growth comes on the energy stored in the plant from the prior season. When we get an early harvest with no leaf-killing frosts in the fall, we can irrigate and fertilize in order to get the vines loaded up for a robust spring breakout. 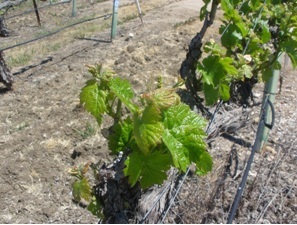 Once the vines break out, the plant is stimulated to come to life and takes over responsibility for ongoing growth. Young canes are very, very fragile. High winds can snap them off. Berry set, which immediately follows bud break has a hugh impact on the size of the overall crop, a good set will get you a cluster that weighs in ¼ to ¾ lbs, depending on the variety. A poor set, possibly caused by high heat or high winds can knock this down by 50%. We’re keeping our fingers crossed, and our frost protection systems primed !